The sentencing part of Lavar Thompson’s double murder began at 9 am, Friday morning, with family and friends from both sides of the case testifying about their relationships. Prosecutors told the jury that Thompson had a drug conviction, that sent him to ADC boot camp, where he was released in 2006. Within a month, he reportedly committed another crime and was sent back to prison. Attempted murder and aggravated residential burglary allow inmates to be released at 25%. First degree murder felons must serve 70% of their sentences. The legislature says the these sentences carry a sentence of 10-60 years, or life. After the prosecution had presented their closing arguments, the defense described to the jury the definitions of consecutive (back to back) and concurrent (all Run at the same time) sentences. Attorney Short emphasized that although Thompson has had some bad days, years ago, that sent him to prison, he has lived over 10,000 “good days,” in his life. The jury went into deliberations to decide the sentences at 10:10 am. At 10:30,the jury of 8 women and 6 men returned with 3 sentence of life plus 50 years, to run consecutively. 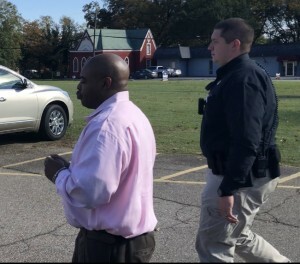 Thompson was taken back into the custody of the sheriff. This entry was posted on Friday, November 2nd, 2018 at 9:45 pm	and is filed under Police /Legal. You can follow any responses to this entry through the RSS 2.0 feed. You can leave a response, or trackback from your own site.